Happy Valentine’s Day! I spent the day with my hubby and grandson, my two favorite guys. We started the day off with a breakfast of pancakes, bacon and scrambled eggs…It was an extremely frigid day here in Northern WI, with wind chills dipping to -12. We decided to hibernate today and stayed in our pj’s all day. 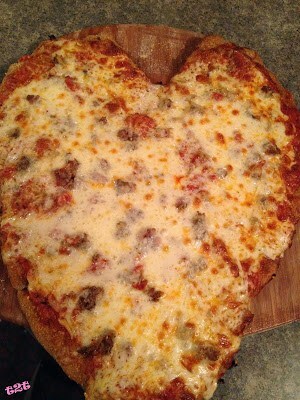 Stone Ground Pizza Crust and a Heart Shaped Pizza is perfect! 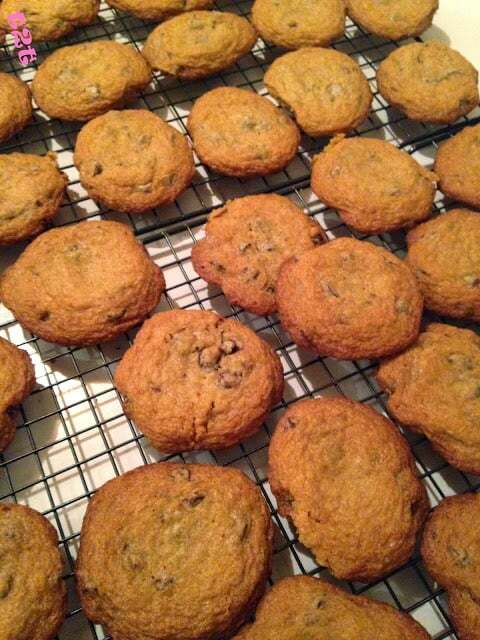 We made chocolate chip cookies in the early afternoon and for dinner we decided on pizza. I had some pizza dough in my freezer and homemade pizza it was. Since it was Valentine’s Day…..why not make a Heart Shaped Pizza. Nothing is better than a homemade pizza and pizza made with a homemade crust…..Fantastic. 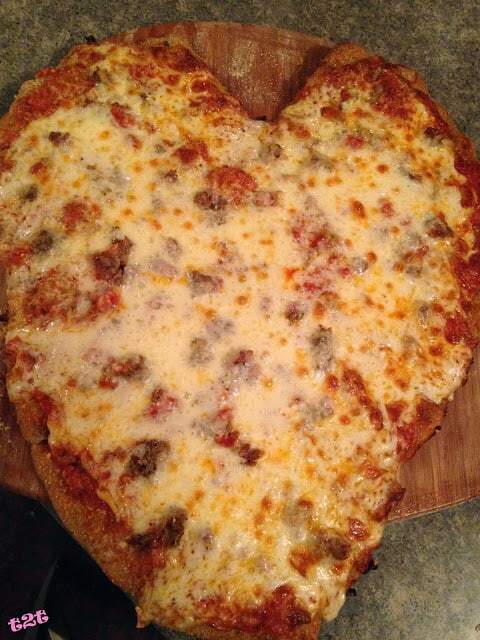 A pizza shaped like a heart well, that’s just plain cute! Stone Ground Rye flour gives this pizza crust a nice nutty flavor. I have made this crust before using whole wheat flour and all-purpose flour, with equally wonderful results. If you want a thin crust, divide dough into two balls. Use one dough ball right away and tightly wrap the second dough ball in plastic wrap and freeze until needed. In a large bowl dissolve sugar in warm water. Sprinkle yeast over the top. Let stand for about 10 minutes and foamy. Stir the olive oil and salt into the yeast mixture. Mix in the stone ground rye flour and 1 cup of the flour until dough starts to come together. Tip dough out onto a surface floured with the remaining flour. Knead until all of the flour has been absorbed and the ball of dough becomes smooth, about 10 minutes. Place dough in an oiled bowl and turn to coat the surface. Cover loosely with a towel and let stand in a warm place until doubled in size, about 1 hour. When the dough is doubled, tip the dough out onto a lightly floured surface. Punch down. Divide dough into 2 balls for 2 thin crusts or leave whole to make one thick crust. Form into a ball. Let rise again, for about 45 minutes or until doubled. Flour pizza peel and sprinkle with 2 to 4 tablespoons cornmeal. Roll a ball of dough with a rolling pin until it won’t stretch any further. Drape the dough over both of your fists and gently pull the edges outward while rotating the crust. When the circle has reached the desired size, place pizza on pizza peel. Shape dough into a heart shape by cutting a “V” in the top and tapering the dough downward to form a heart. Top pizza with toppings: sauce, small pieces of Italian sausage, mozzarella cheese and Parmesan cheese. Lightly drizzle top with olive oil. Bake for 16 to 20 minutes in a preheated oven or bake until the crust is crispy and golden brown and cheese is melted. Cooking times will vary depending on how thick or thin the crust is and if you bake the pizza in a pan or place directly on oven rack.